This past weekend was my 39th birthday. To celebrate my final year in the 30s my wife and I decided to go to Restaurant North in Armonk. With a 2 year and 3 month old at home, evenings out are few and far between for us right now, so this was a nice little treat. Established by former Tavern (Garrison) and Union Square Cafe (NYC) alumni, Restaurant North has a farm-to-table motif and has received glowing reviews from critics and consumers alike. I have heard great things from friends and colleagues as well, so it seemed worth giving it a shot. Instead of writing a lengthy, and possibly somewhat witty, review of the restaurant I thought a chart may be a little more succinct. 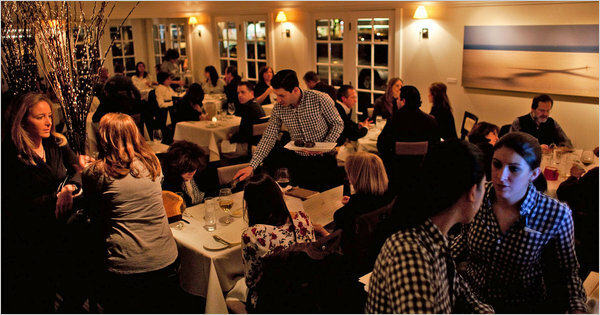 Below is a list of pros and cons about Restaurant North, with a lot more pros than cons. BYO for your first bottle of wine, no corkage! * But you must purchase off their wine list after first bottle. Still a great feature. They take the bottle you bring to the back of the restaurant to open and breathe before serving…I prefer it left on the table. Lively atmosphere with lots of energy without feeling pretentious. A bit heavy on the salt, almost everything was a little over seasoned. Menu varies weekly depending on what they have coming in from local farms, lots of selection. Chicken was so salty that had to be sent back, chef bought out another chicken with a little bit of attitude. Attentive and knowledgeable staff. Dessert was just eh…disappointing. Super fresh food with a creative menu, yet approachable to a non-foodie. High quality stemware for wine service. Prices very fair for a top quality Westchester restaurant. Nice pace of service, never felt rushed and never had to wait too long. A complimentary muffin-to-go for your breakfast… nice touch! So as you can see the “why you should go…” side clearly wins out here as overall it was really a pleasurable dining experience. I wouldn’t say it’s my new favorite restaurant in Westchester, but I would certainly be inclined to go back. The nice part is with apps and flatbreads in the $10-16 range and pastas in the $13-20 range, you can bring a bottle with no corkage fee and enjoy a high quality meal for around $50-60. That’s tough to beat in this neck of the woods. So if you’re looking for a solid meal out in the Armonk area, I would certainly recommend trying Restaurant North. But if you are sensitive to salt you may want to ask the server if they can lay off some of the salt in the food preparation, which they are more than willing to do.